For decades, World Vision has partnered with the United States Agency for International Development (USAID) to implement lifesaving development projects around the world. In this blog series, we’re looking at the success stories of USAID’s 2018 report, Acting on the Call, which describes the amazing progress in newborn and child survival in just the last few years. Read the introduction to the series here. When sisters-in-law Srijana and Bimala became pregnant with just two months separating their due dates, they attended mothers’ group meetings together. During one of these meetings, Durga, their village female community health volunteer (FCHV), taught them about the importance of chlorhexidine, a simple antiseptic gel proven to prevent infection among newborns if applied to the umbilical stump immediately after cutting the cord. In Nepal, 43 percent of deliveries happen outside of a health facility, making newborns more vulnerable to infections and less likely to benefit from best practices around care. However, a clinical trial in Nepal showed that a simple chlorhexidine gel, developed for use on umbilical cords, is an effective way to improve newborn health, even outside of a health facility. Chlorhexidine is a gel that is applied on the newly cut umbilical cord to prevent infection. It costs about 10 cents per tube. It is a common antiseptic, used regularly in medical practice, but only recently have the benefits of chlorhexidine to prevent newborn infection been realized. Following a clinical trial showing reductions in newborn deaths by 24 percent and newborn infections by 68 percent, USAID convened a group of health experts and researchers to work with the government to scale up the use of chlorhexidine across the country. How was that made possible? 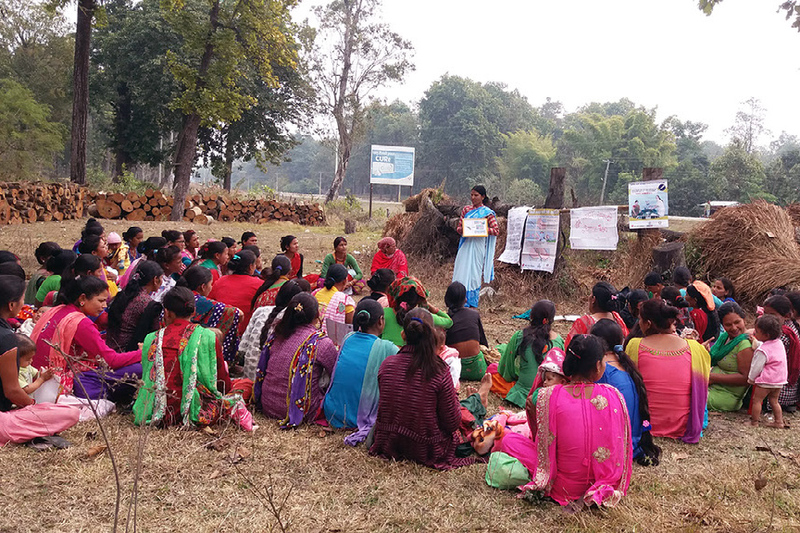 By integrating chlorhexidine programs into Nepal’s ongoing public health programs, and its skilled birth attendant and nurse-midwife training curricula, to ensure program sustainability and government ownership. Between 2012 and 2017, an estimated 9,600 newborn lives have been saved in Nepal, as a result of USAID’s support to rollout chlorhexidine. Chlorhexidine is now used nationally, and procured locally. The Ministry of Health and Population purchased 600,000 tubes of gel for 2016-2018 and they have commited to buying another 700,000 in 2018. What does the United States have to do with it? USAID’s support helped train more than 62,000 health workers and FCHVs across Nepal on proper chlorhexidine use. Additionally, USAID advocated for integrating chlorhexidine into Nepal’s national strategy, which resulted in chlorhexidine being added to the National Essential Medicine List (meaning the government was committed to procuring it as needed) and a government policy stating that pregnant women should receive chlorhexidine free-of-charge in their eighth month of pregnancy or during their fourth antenatal care visit. To ensure pregnant women were aware of this policy and the benefits of chlorhexidine, USAID and the government even carried out an educational campaign on television, radio, and through community-level activities. How is it helping mothers and newborn children? USAID’s work to integrate chlorhexidine into Nepal’s existing health system has helped women like Srijana and Bimala provide lifesaving care to their children, and means this standard of care will be available to pregnant women nationally. When Srijana was eight months pregnant, she received a tube of chlorhexidine at an antenatal care visit, which she then brought with her to the health facility when she went into labor. The health facility had its own stock of chlorhexidine however, and the gel was appropriately applied to Srijana’s newborn’s belly button. When Bimala went into premature labor at home, a family member went to Durga’s house in the middle of the night to get the tube. As a result of USAID demonstrating the effectiveness of chlorhexidine and supporting its use, the Government of Nepal now procures their own tubes of gel without USAID assistance, and fully incorporates this high-impact intervention into national standards of care. This is a major improvement in service capacity and a big step on the journey to self-reliance.